Fatal Fury 2 was the first sequel to SNK's fighting series Fatal Fury. It had the characters fight each other in locations around the world. 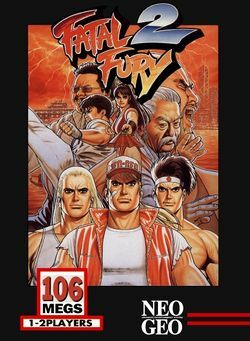 As an improvement over its predecessor, players could choose between 8 different playable characters (as opposed to 3 in the original Fatal Fury). 4 computer-controlled boss characters where added. The game was later ported to the Sega Genesis and SNES by Takara, and to PC Engine by Hudson Soft. It was also one of the first fighting games to include a Desperation Attack (called Super moves) that could only be executed when a player had low vitality. Fatal Fury 2 also marked the introduction of Mai Shiranui, who would later become one of the fan-favorites in the King of Fighters series. This page was last edited on 14 January 2012, at 01:17.